Universal Studios Hollywood have prepared for their #UniversalHolidays with Christmas in the Wizarding World of Harry Potter, going on now through January 6, 2019 at Universal Studios Hollywood. Visit “Christmas in the Wizarding World of Harry Potter,”which runs daily from November 17, 2018 through January 6, 2019 for an array of changes to the already magical Hogmade. A nightly glistening snowfall to enhance yuletide spirits falls over the main street at the Wizarding World of Harry Potter with multiple snowfalls begin at 5:15 p.m. until the park closes. The snowfall is enjoyable as visitors of the park get the opportunity to see snow fall in Los Angeles. It may be a brief snowfall, but it is still incredible to experience and enhances the wonder which is already a part of the Wizarding World of Harry Potter. A newly introduced holiday-themed fare and the addition of hot Butterbeer, which was introduced earlier this year, at Three Broomsticks makes for a wonderful dinner before enjoying the beautiful additions to the Wizarding World of Harry Potter. The a cappella Frog Choir featuring Hogwarts students entertaining guests with their harmonized holiday themed songs perform and are great to watch before The Magic of Christmas at Hogwarts Castle light show. The music by the a cappella Frog Choir is a fabulous show which every visitor of Universal can enjoy. The Magic of Christmas at Hogwarts Castle dazzling light spectacular goes on nightly as Universal Studios celebrates the #UniversalHolidays at about 5:40 p.m., 6:00 p.m., 6:30 p.m. and 7:00 p.m. (times may vary each night). 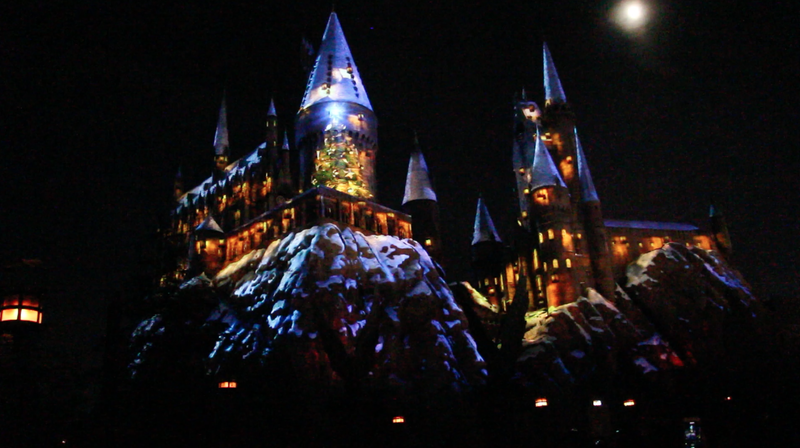 The light show at Hogwarts Castle is always breath-taking, but for the holidays it seems a bit more magical. The Christmas time light show completes the package of Holiday treats, the video may show the light show, but there is nothing like being there in person and experiencing it first-hand. Being surrounded by hundreds of Harry Potter fans all in awe of the brilliant show. Then head over to the shops at the Wizarding World of Harry Potter for a wide selection of custom-made Christmas ornaments created especially for the Wizarding World. The wonderful ornaments carry the crests of the Hogwarts houses and will go beautifully on any Christmas tree or to decorate around the house. Visit “Christmas in the Wizarding World of Harry Potter,”which runs daily from November 17, 2018 through January 6, 2019.